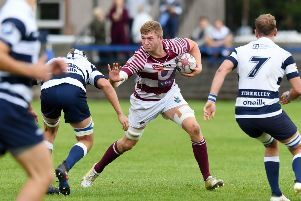 Heriot’s full back John Semple is relishing the opportunity to add further polish to his impressive rugby CV when the Goldenacre men seek to retain the BT Premiership title be beating Ayr in tomorrow’s grand final at Millbrae (kick-off 3pm). The globetrotting Irishman arrived in the Capital last summer having helped Italian outfit Bologna top their league. Prior to that he had played his part in landing honours in two other countries. After featuring for a Ballymena squad that earned promotion in the All Ireland League in 2012, Semple set off to experience life in New Zealand where he tasted success at provincial level when he and his East Coast colleagues won the Heartland Championship. An injury kept him out of action for a full season before he moved to Spain where he turned out for Ferrol and Vigo and then on to the Italian leg of his international adventure. With a girlfriend based in Edinburgh where she is training to be a GP, Semple was keen to make the city his next rugby destination and after seeking the advice of Heriot’s winger Charlie Simpson, who also hails from Ballymena, he decided the move was right for him. He is impressed by the standard of the club game in Scotland. “It’s streets ahead of the level I had played at in Europe. In New Zealand there were so many x-factor players – Maoris, Samoans and Fijians – that it was different. Having contributed to victory in the pre-season Charity Shield and then earning man-of-the-match honours in last week’s BT Cup final success over Melrose, Semple, who is now settled in the Capital where he works as a locum pharmacist, is raring to go as the Goldenacre men bid to become the fifth side to win the league and cup double, albeit Boroughmuir also paired victory in the knockout competition with the second division title in 2000. There are two changes to the squad that landed the silverware at BT Murrayfield last weekend, with back rower Iain Wilson dropping out because of injury and Andrew Summers giving way to Hugh Fraser on the bench. Alex Henderson is promoted to a starting berth instead of Wilson, with Glenn Bryce returning from Scotland sevens duty to take a place among the substitutes.